* Gloves come packaged in plastic seal bag with Finn moto card. * No logos or advertising is put on the product. 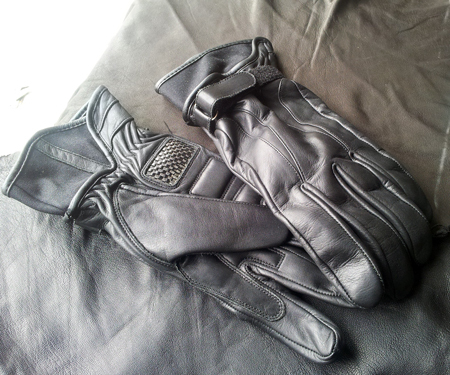 Since receiving these gloves I have been impressed with the easy wearing style & comfort. They blend in well with the other clothing I wear and are warm to beat the winter cold. I really like the fit and feel of these gloves, I was hesitant thinking the Kevlar would give a bulky feel but it didn't. They are very slim and feel snug and secure. Only 1 gripe, one of the fingers is longer then the other glove 's fingers, so there is a small gap at the tip of one of my fingers...but I can live with that. Well worth the price. It's a great quality glove. The leather is top grade and the glove fits very slim, as in you feel much more in touch unlike some gloves that feel bulky. I think it will be more suited to summer as current weather in Melbourne (July - Winter and Wet) may be a bit too much. Great price and good quality overall. I bought these gloves to replace my summer pair, which is really finished. They fit perfectly and you can trust the size table, provided that you take measures correctly. It's a bit hot inside, as there are no vents and the kevlar layer is all over the place, but I guess it can be used throughout the year, except, perhaps, when temperature is on or above the mid thirties (not common in SA, anyway). If you're a Queenslander, it will be the perfect winter gloves for you. I wore them for the first time this weekend (ANZAC, 2016) when I and my wife rode to Berri (roundtrip is roughly 470km). Fit was perfect since the very start and it always feels good when on (flexible and sensitive). To make matters even better, they are light and look nice on one's hands. I don't think one can find similar quality for the price. Ordered XL on advice from Finn Moto website, fit like a Glove (play on words) very comfotable riding with great feel for indicators and the likes!!! Found Gloves little tight at first,after few days riding Gloves now feel like a natural firm fit,not bulky thus allowing more finger use were removal off gloves was necessary.